Picture a lazy, hazy summer afternoon reclining on a beach chair at your favorite sandy spot on the shore as you stitch this free needlepoint project. Download and save the free needlepoint chart first, and then get familiar with the subtle color changes as well as the stitch techniques you plan to use. 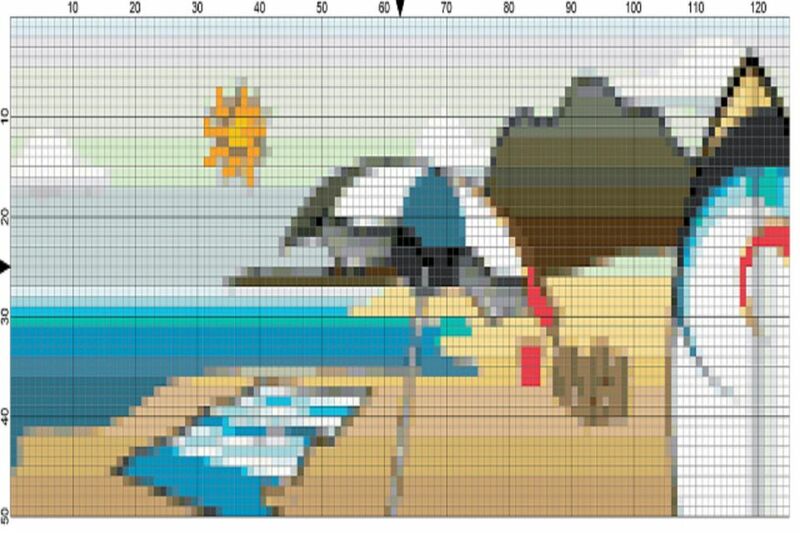 The Beach Scene Needlepoint Chart is easy to follow and produces a complete design that is 8.93-inch by 3.57-inch needlepoint when stitched on 13-mesh mono needlepoint canvas. Traditionally, you would finish a nostalgic summer beach scene like this one into a needlepoint pillow or framed picture; however, you can get creative with this project for there is no right or wrong way to finish it. How you decide to finish the completed needlework can be as creative as the summer scene needlepoint design itself. After you have put a week or two of effort into stitching, it certainly makes sense to finish the completed needlepoint in the best and most appealing way possible. Photo Album or Scrapbook Cover - Add a touch of whimsy to your cherished summer memories by working a needlepoint insert to mount on top of a simple cardboard case or notebook. Beach Cottage Throw Rug - Stitch the needlepoint pattern on rug canvas using quickpoint stitches to make a fun rug for a beach house or vacation home. It's a great way to have to keep your needlepoint beach scene "underfoot." Beach-Themed Purse- For a spectacular fashion hit, finish the completed needlepoint into a small bag to hold sunscreen and sunglasses. Don't place a limit on the finishing ideas—there are an enormous number of other possibilities as well as countless ways to create decor items for your summer home and gifts for family and friends. Lucky recipients of your handiwork are sure to be impressed by your efforts. Because of the many small color changes, you should use traditional needlepoint stitches. This needlepoint design works up especially well with basic needlepoint techniques. For beginners, once you have mastered the tent, continental, and basketweave stitches, it is quite simple to work them across the canvas, changing colors designated by the full-color needlepoint pattern as you stitch. For best results, start stitching in the center and work outwards in any direction. It is much easier to count the stitches from the center of the chart and match them to that of the needlepoint canvas if you work in this manner. When working with so many colors, thread multiple tapestry needles. For added flair, work a geometric or seashell needlepoint border in two of the colors used in stitching the design. Before removing from a needlepoint frame or beginning the finishing process, use a few strands of thread to work your initials and the date in one corner of the stitched area. Here's a perfectly formed needlepoint clamshell that’s just waiting to be stitched in spare moments and while on-the-go! Whether it's your first needlepoint project or your one-hundredth, you'll have so much fun with the 3.57-inch by 3.29-inch super easy needlepoint design that you won't believe how quickly you stitched it! The versatile pattern is sure to add the perfect touch to an authentic seashell collection or as a summer decorating accent for a beach home—especially when framed and hung on a wall in an entry foyer or cozy vacation nook. You'll make 50 stitches wide and 46 stitches high, which makes it ideal for working and completing as you travel to and from work or a favorite vacation spot. It will also convert successfully for cross stitch as well. If you're just getting started with needlepoint, this is a great project to stitch all by yourself without taking a class or needing a teacher to look over your shoulder as you work. Since the project is so small, You can finish it in one evening. Black or Dark Gray for the outline and clamshell ridges. Pale Yellow, Off-White or Very Pale Gray to fill in the remainder of the seashell. If you want to get fancy or add depth to the stitching, you can use carefully graded shades of these colors and try some creative blending with the encroaching gobelin stitch or other technique. Only start working on the project by downloading the free clamshell needlepoint chart. Enlarge the needlepoint pattern as needed and print it in color. The finished needlepoint will only be as good as the canvas, thread and other supplies used to create it; so buy the best materials that you can afford--even though the project is a small one. Needlepoint veterans who are looking for a break between two or more complicated or large projects can have just as much fun as a needlepoint "newbie." The project is charted to allow those with experience to be as creative as they like by experimenting with a variety of stitch techniques, novelty threads, and fancy trims, beads, and embellishments. Experienced stitchers and young needlepoint designers may want to use the clam seashell motif for one or two of their original needlepoint pieces. Here are a few ways to complete the clamshell needlepoint piece. Add initials, a fancy monogram or name at the bottom of the needlepoint design. Work an ocean-themed needlepoint border around the clamshell so that it can be made large enough to turn into a pillow. Use the needlepoint design for a pin cushion worked in stranded cotton embroidery floss on 18-mesh instead of 14-mesh needlepoint canvas. Work the needlepoint on perforated paper canvas and turn it into a greeting card insert. The person who receives the card can then frame or finish it as desired. No matter how skilled or experienced you are at working a needlepoint project, occasionally things go wrong, like accidentally cutting a hole in the needlepoint canvas when snipping a loose thread. Learn how to make repairs and correct the most common problems as you work with the needlepoint design. Looking for a quick and easy summer needlepoint pattern that’s cute as a button? Check out this free simple seahorse design that works up in under two hours (depending on your personal stitching speed) with different blue and green threads that will remind you of the ocean and seashore. The adorable little seahorse needlepoint design is 30 stitches across the widest point and 54 stitches across the longer point, making the finished design area 2.14 inches by 3.86 inches when worked on a scrap piece of #13 or #14 mesh mono needlepoint canvas. Use these tips for working the needlepoint project. They will you have you stitching an entire herd of seahorses for summer fun! To work the design as charted, download the free seahorse needlepoint pattern and follow the colored blocks (each block represents one stitch), starting in the center of the pattern as well as the canvas for stitch placement. Work in any direction you desire to complete the needlepoint. As an alternative, place the seahorse wherever you’d like on the canvas. To begin stitching, determine whether you would like the needlepoint design to be in one of the four corners or the center. Then, trace the pattern outline at that desired place with a waterproof, permanent fabric marker. Use this as a guide when placing textured and decorative stitches. Mount the blank needlepoint canvas on stretcher bars or in a roller frame to retain its shape—especially if you plan to use surface embroidery or specialty stitches. The thread you decide to use will make or break this needlepoint project. Two strands of Persian wool or one strand of tapestry wool in shades of watery blue and green would work well in stitching the seahorse needlepoint design. If you decide to use a lot of colors to make the seahorse design more vibrant, you will need to organize them so that you don’t get confused and use the wrong color. Separate the threads into groups of blue and green and label each skein. Make a reference key on the needlepoint chart so that you will be able to see which color to use. Beginners may wish to work the entire design in simple tent needlepoint stitches with the occasional decorative stitch for texture. To make the seahorse look realistic and three-dimensional, try your hand at working a few specialty stitches such as a variation of the Spider Stitch Technique for the body and padded stitches for the face and head. Try to capture the spirit of the ocean as you work the beautiful blues and greens in the design. Feel free to extend the background fill area to work a mini needlepoint pillow or another large item. Use colors that complement the stitched seahorse. For a quick-to-stitch striped background, work the area around the design in alternating vertical rows of two carefully graded colors of thread. For added texture, make every other row a different size. For example, work one vertical row of diagonal stitches over four canvas mesh, and the next row over two canvas mesh. Alternate with color changes to create a subtle strike effect. Embellish the finished needlepoint with a bead for the eye and random backstitches around the outline of the completed needlepoint with very fine silver or white metallic braid. Before you know it the lazy days of fun in the sun and surf will be over and done; but until that happens, you can still make a few needlepoint seashells and an adorable starfish with this free needlepoint design. There are a variety of ready-made serving trays, hot pads, and trivets that have been designed especially for needlework. This 4.57-inch by 4.29-inch starfish needlepoint design would make a great insert for one or more of these kitchen items. Since the simple needlepoint design is quite versatile, it can be used in a variety of other ways as well. Here are a few ideas for finishing the starfish needlepoint project. Add an elaborately stitched monogram and work the design on perforated paper canvas as an insert for a sensational birthday or all occasion greeting card. Personalizing the starfish design by adding an initial, name or date is very easy to do. The recipient can frame the needlepoint after the event is over. Work on #18 mono needlepoint canvas in tent stitch with Persian wool, and finish the attractive design into a pin cushion. Either use one of the wooden pincushion bases that are sold online or in needlepoint shops; or make a soft mini pillow-like pin cushion. Use the stitched starfish as a center needlepoint panel for a fabric throw pillow. Stitch according to the needlepoint chart and turn the completed needlework into a cover that will add a personal touch to a special keepsake box. Makes great storage for lots of seashells and found objects from summer vacations. Make a framed picture worked in cotton embroidery floss as a gift for a friend who loves the sea and everything about it. The correct choice of frame can, quite simply, make or break a piece; so spend time selecting a frame that fits the needlepoint. Using waste canvas and stranded cotton, work the starfish pattern on a jeans pocket, towel or any other item of clothing or household fabrics. The starfish would also look wonderful stitched on sea-themed or plain table linen. Make several starfish, changing the canvas size, color and thread choices for each one and finish into tree ornaments. Incorporate the starfish needlepoint pattern into a larger more complicated needlework design as a challenge for an experienced needlepointer. There are countless reasons for working this needlepoint project. You can use the rustic design in many different ways to create wonderfully unique and totally original gifts. To get started, download the free starfish needlepoint design and find the center of the chart as well as the needlepoint canvas. Work in continental and basketweave tent stitches out from this point. The starfish needlepoint design shows how versatile a simple tent stitch pattern can be. As the basic half-cross tent and continental stitches tend to distort the canvas, mount the needlepoint project on stretcher bars or in a roller frame before stitching. It’s so easy to miss stitches or even whole areas of the needlepoint chart with a design as color dense as this one; so always make a point of checking the completed needlepoint project against the diagram before removing it for final finishing. Turn your work over and check for loose, trailing threads. Make sure that all threads are secure, and then clip any loose strands as close to the stitching as possible without cutting the stitches. Stretch and block the completed needlepoint using a blocking board. This part of the finishing process is vital, and it is always worth taking the time to pull and block the piece--even if you have stitched it mounted tautly in a frame. Stitch one or more sand dollar needlepoint seashells to perk up your summer decorating at home or while vacationing at the beach! Working this simple 3-inch square needlepoint seashell is quick and easy and requires little effort to complete. You only need leftover thread and canvas from your stash as well as general needlepoint supplies. You can turn the needlework into a practical yet lovely beverage coaster to cradle refreshing drinks to sip while enjoying the ocean view. Easy-to-work needlepoint stitches such as tent, continental, or basketweave would be appropriate. For single lines of stitches, use the continental, and for different color changes, try the tent stitch instead. For large color areas, work the basketweave stitch as much as possible. Whether you’ve stitched needlepoint for years or you’re just a fledgling beginner, this playful needlepoint design will get you excited about summer and the seashore. The full-color needlepoint chart is easy to follow and will make working the design fun and pleasurable. For color inspiration, find a real sand dollar sea urchin to study the subtle colors of nature as well as the different shades of white to be found in a preserved sand dollar seashell. A flame-shaped pattern made by working Bargello needlepoint stitches with different colored yellow, gold, and light brown threads or different shades of one color, would make the needlepoint design fascinating. Or, use textural stitches such as French Knots to make certain portions of the sand dollar design pop! There’s no need to estimate thread quantities; just use whatever you have on hand that matches the color scheme you’ve selected—blending, as needed, as you work your way across the canvas. Think out-of-the-box when working this design. Experiment with a few non-traditional materials such as summer print fabrics or an actual sand dollar seashell, Couch these materials on top of the canvas and work basic needlepoint stitches around the outline as well as the background. When working the background, choose a color of thread that closely matches the natural shade of the needlepoint canvas. Work a lacy darning or open-weave wallpaper needlepoint stitch pattern to draw further attention to the stitched sand dollar. Here are a few tips for starting the project. Cut the piece of canvas to the desired working size. For 13 to 14 mesh canvas, you’ll need a piece that is at least 6 to 7 inches on all four sides. Bind the canvas edges with masking tape or fold them under and hem with a sewing machine. Download the free sand dollar needlepoint chart. Enlarge as needed and print in color so that you can follow the shape of the design and quickly count the number of stitches you will be required to make. Start working in the center of the canvas and the chart and stitch outward in any direction from this point. For quick stitching, leave the background blank. Place a piece of black waterproof fabric (if making a coaster) or regular plain or print fabric behind the canvas when finishing. Or, if you really must stitch over the entire canvas, choose a whimsical background pattern that you will enjoy stitching. This little needlepoint penguin is so cute in his sailor outfit that you'll want to stitch one for yourself as well as one for the playroom. Not only will you find the project enjoyable and relaxing, but you'll also receive immense satisfaction from finishing it into something fun and useful. Are you just learning how to needlepoint? If so, the Sailor Penguin Needlepoint Design is the perfect project for a needlepoint newbie like yourself to teach you the basics. All you need to know are a few classic stitches like the tent, continental, and basketweave. As you get more comfortable with working on canvas, you can add a few cross stitches and other easy embroidery techniques. Add a bit of flair to your home decorating and a personal designer touch with an accent needlepoint piece you made yourself. Stitch it with supplies you already own and finish it yourself. Bind the needlepoint canvas on all sides with masking tape. Hold it in one hand as you work stitches in and out of the canvas with the other one. Make each stitch in one step by coming up through the wrong side of the canvas and going down diagonally (if using tent stitches) or straight over the desired number of mesh threads and down back into the canvas. At this point, the threaded needle, positioned to make the next stitch, is brought up through the canvas again--just like in hand-sewing. When using this method, it is crucial to pay careful attention to your stitching tension--especially if working on mono needlepoint canvas, as too tight or loose stitches may distort the canvas and spoil all your hard work. If you prefer, find stretcher bars small enough to mount the canvas for stitching to use the two-step hands free stitching method. You will be able to control your stitching tension and reduce the amount of canvas stretching during the finishing process. With only 50 stitches wide and 59 stitches high, the comfortable sailor penguin needlepoint design works up quickly—particularly if you use 14-mesh plastic canvas for beverage coasters. In less than 2 hours, you can stitch one needlepoint coaster with all six strands of cotton embroidery floss threaded in the tapestry needle at one time and your choice of stitch techniques. After stitching, simply whipstitch around all four edges and attach a piece of sticky felt or use a hot glue gun to put fabric lining on the back to protect your work. Your coaster will be ready. Two Free Owl Needlepoint Patterns to Stitch Anywhere on Anything!